Little is known about the god Forseti, and yet he is counted among one of the twelve major gods of the Northern Tradition. His name means “president,” “presiding one,” and “bridge-builder.” He attested to in the Prose Edda, and in the archaeological record. Forseti is considered the god of justice, fairness, social harmony, peace, and reconciliation. He dwells in Ásgard, in a glittering hall of silver and gold, called Glitnir – a celestial courthouse where he settles as disputes as divine judge. He is the son of Baldr and Nanna, gods of peace and purity in their own right. Aside from this, not much is known of him through the surviving lore. 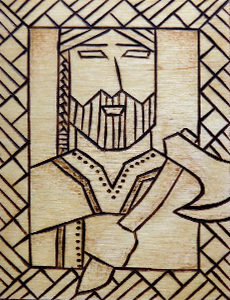 He is like Ullr, who we also know little about through the mythology, but who’s cultic activity denotes his significance. Forseti was worshiped most heavily in Frisia, an area that borders Germany and Holland, where he seems to have been a chief deity. He was also worshiped in groves throughout Scandinavia, and in the Helioglad isles in the Northern Sea. Anglo-Saxon raiders brought his worship to England. A famous legend is told of him and his miraculous interventions. The Frankish King Charles Martel (c. 688) forcibly brought Christianity and Christian law to the Frisian Law-Speakers, twelve dignitaries of that tribe. He insisted that they submit to his ways, or else be executed, enslaved, or cast out to sea in a boat without oars onto the open ocean. The Law-Speakers chose the last of these options, and prayed to the gods for help. As the story goes, a thirteenth man appeared in the boat with them, bearing a gleaming axe made of gold. Using this treasure, he paddled the boat to shore, saving the Law-Speakers’ lives. He then chopped into the land with his axe, causing a fresh-water spring to gush forth. He told the men his name was Fosite, and taught them a new code of laws and legal negotiation skills. He then disappeared. The site of the fountain became a sacred shrine. Christian writers syncretised and replaced Fosite with Saint Willebrord, who was venerated at the site of the fountain. Modern Heathens associate him as the god who presides over the Thing, the sacred assembly where legal matters are discussed. As such, Forseti is associated with sanctifying space, and is honoured by reverent silence. He is described, like his father, as a shining and radiant god, bearing his golden axe, a symbol of peaceful negotiation. Forseti is considered one of the younger generation of gods, and it is noted by modern Heathens that the god of justice is the son of a most unjustly framed murder victim. Forseti stands out as a just legal arbiter in the Viking age of vendettas and vengeance, and he is a god of peaceful reconciliation. He’s one of those gods who reveals that there was more to our Heathen ancestors than common stereotypes would have us believe. A golden axe or double-headed axe. White linen, edelweiss flowers and hawks. The Thing, laws, judges and courtrooms. A boat without oars. The colours red, purple, and gold. The metals silver and gold. Silent reverence. Springs, spring water, and fountains. Several expressions come to mind, such as “cool your jets”, “bury the axe” or “silence is golden.” The rune Reið. Fosite, Forete, Foseti, Forseta, and Foresitta.